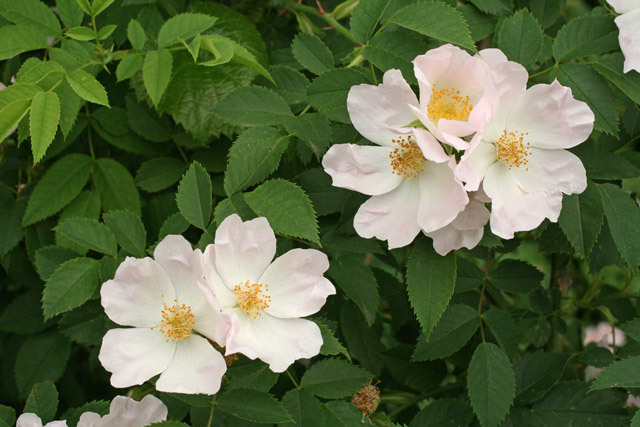 There are 11 species of rose growing wild in Ohio, of which five are native, six are alien. There is a rose shrub flowering profusely at the edge of the woods at OSU’s outdoor plant research area, Waterman Lab, which is familiarly called “Waterman Farm.” A few days ago it seemed the petals of this rose were more rose-colored than they are today; now they are almost white. It turns out to be one of the introduced (escaped from cultivation) ones, Rosa canina, “dog rose.” How can you tell? Waterman Farm, Columbus OH, June 2, 2008. One of the features that sets apart groups of roses has to do with the group of styles that emerges from the mouth of the floral cup (hypanthium). In some species (not this one) the styles extend out above the mouth for some distance as an elevated projection, whereas in the group to which dog rose belongs, the styles stop abruptly just above the mouth. Waterman Farm, Columbus, OH, June 2, 2008. A feature of the calyx (sepals, considered collectively) is important too. 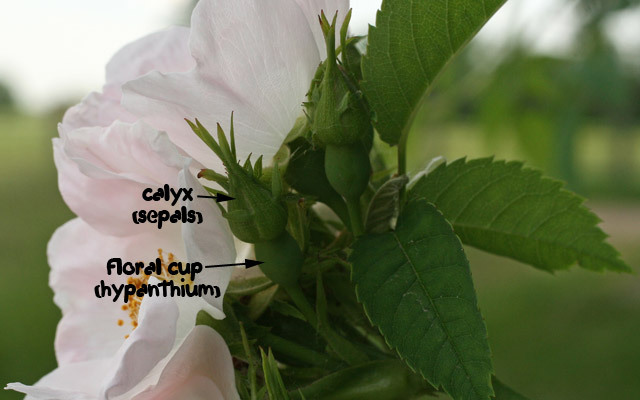 In some species (not this one), all the sepals are more or less the same, whereas in the group that dog rose belongs to, the outermost sepals have narrow leaf-like side extensions. 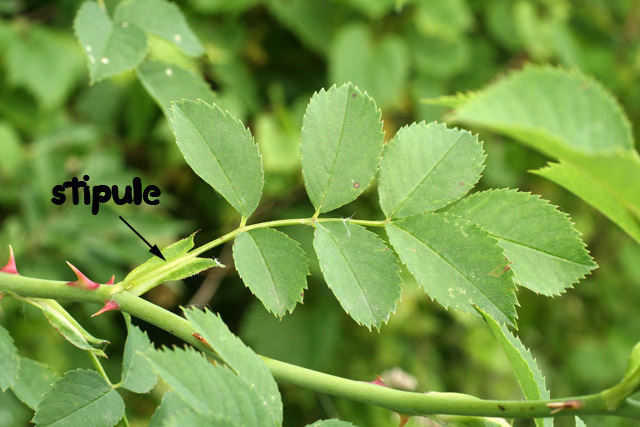 Rose leaves are pinnately compound and have prominent persistent stipules at the base of the leafstalk. The stipules are of diagnostic value, as in some species (not this one) they are hairy or have frilly edges. 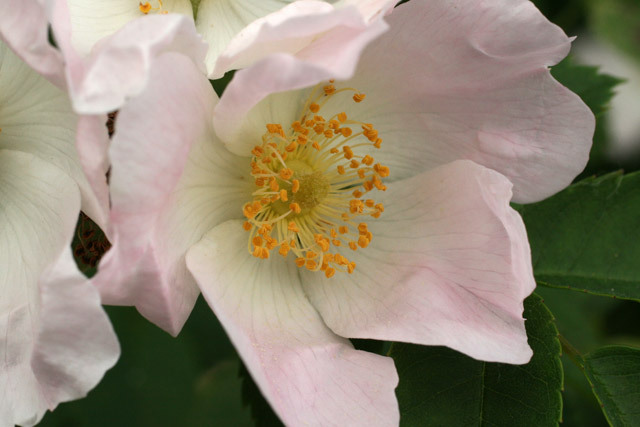 Dog rose stipules are smooth-edged and hairless, and attached to the leafstalk for most of their length. June 2, 2008, Waterman Farm, Columbus, OH. This bug (it really is a “bug,” because entomologists use that word in a scientific way in reference to any member of the order Hemiptera) is a stinkbug. 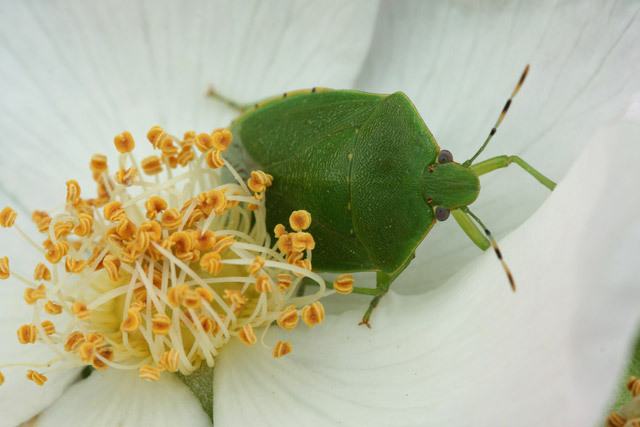 Stinkbugs are called that because they give off a bad smell if they are crushed or handled roughly. Is this one a plant-eating stinkbug or a predatory stinkbug that is waiting there to attack a pollinating insect? Waterman Farm, June 2, 2008.